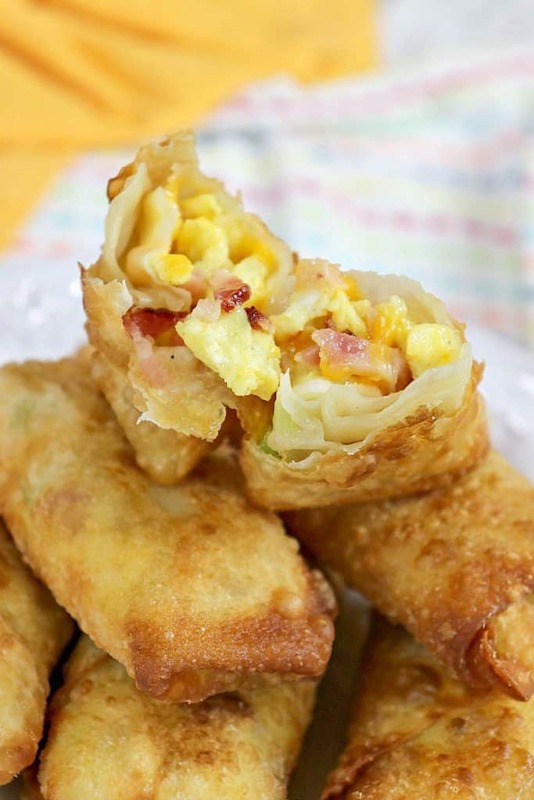 Crunchy Scrambled Egg Rolls are simply the best breakfast you didn’t know you needed! Be ready to have your taste buds rocked with these rolls! **Please Note – The printable recipe card with detailed instructions and complete ingredient measurements for making Crunchy Scrambled Egg Rolls is available near the end of this post. 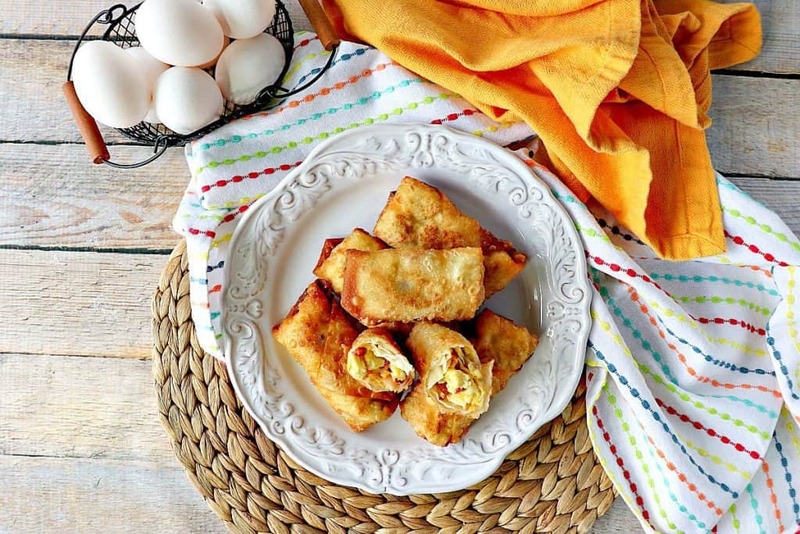 When you want to up your breakfast game and bring your family something delicious and yet something they didn’t see coming, then these Crunchy Scrambled Eggs Rolls is just the ticket! 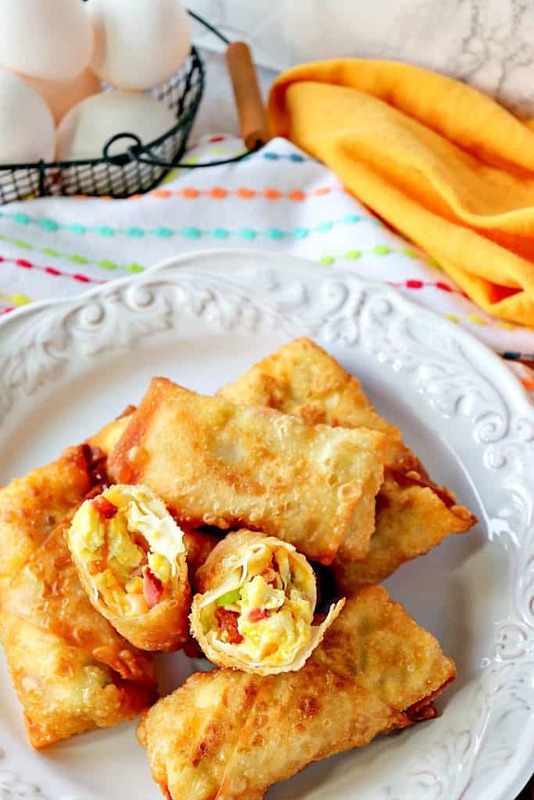 We filled our scrambled egg rolls with shredded cheddar cheese, precooked bacon, and scallions. But, if you want to mix things up and add your favorite “egg-stras”, by all means, be as creative as you like. Add mushrooms, green pepper, ham, broccoli, onion, spinach…you get the idea! Can I use other oils for frying? Does it have to be peanut oil? The key for the best frying oil is one with a very high smoke point. If done correctly, frying foods isn’t at all unhealthy. If fried foods are cooked with the right oil, at the right temperature, very little oil will leach into the food. What is the proper oil temperature for frying foods? What if I don’t have a cooking thermometer? Is there any other way to judge the temperature of the oil? A valuable tool I have used over the years for judging proper oil temperature is to stick the handle of a wooden spoon into the heated oil. If tiny bubbles immediately form and float to the surface (much like bubbles in champagne, only faster), your oil is ready to fry. If this doesn’t happen immediately, wait a few more minutes. If the oil isn’t hot enough to begin frying, the food will soak up the oil before the frying takes place making foods oily and unhealthy. 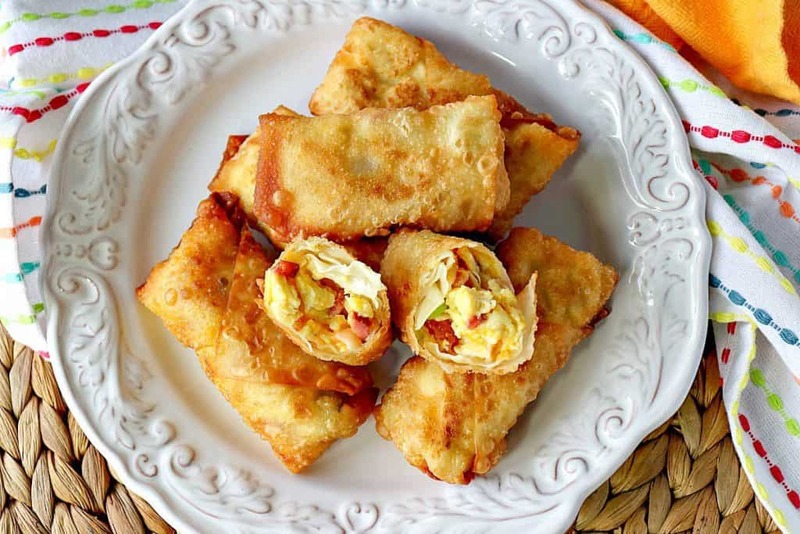 Below is the printable recipe card for today’s Crunchy Scrambled Egg Rolls. If you’ve enjoyed this recipe and look forward to making it (or have already made it), I’d appreciate if you’d take a moment to give it some feedback by way of stars near the comment section at the end of this post. Thank you so much! 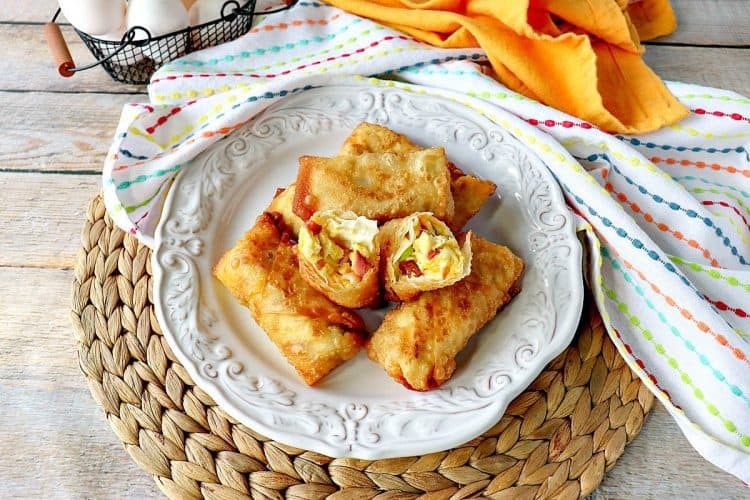 Scrambled Egg Rolls are simply the best breakfast you didn't know you needed! Be ready to have your taste buds rocked with these rolls! In a large bowl, whisk together the eggs, milk, salt, and pepper. In a large skillet, heat the avocado oil over medium/low heat. Add the scrambled eggs and cook, stirring occasionally, to your desired doneness. Cool slightly. 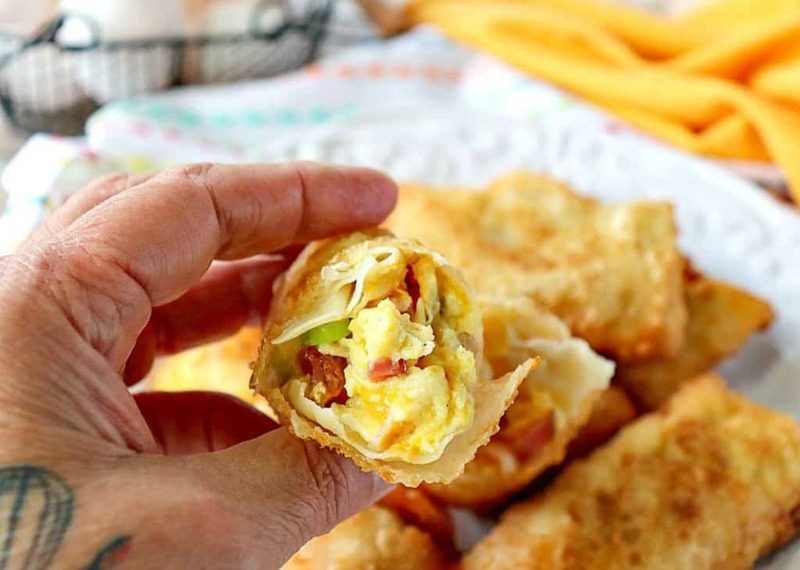 Wrap approximately 2 tablespoons of the scrambled eggs, 2 teaspoons cheddar cheese, 2 teaspoons chopped bacon, and 2 teaspoons scallions into an egg roll wrapper. *Note - use a bead of water to glue the edges of the egg roll wrapper together so it stays closed. Set the scrambled egg rolls aside while the oil heats. Heat the frying oil in a large, high sided pan to a temperature of 375-degrees. Add the scrambled egg rolls, 4 at a time to the hot oil and fry on each side (turning carefully) for approximately 40 - 50 seconds per side. Remove the scrambled egg rolls from the oil and drain immediately on paper towels. large high-sided skillet or pan (for frying), large skillet (for making scrambled eggs), whisk, tongs, paper towels, kitchen thermometer. 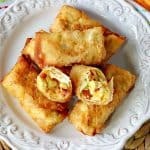 I sincerely hope you’ve enjoyed today’s recipe (and video) for Crunchy Scrambled Egg Rolls as much as I’ve enjoyed bringing it to you! What a unique idea, I bet this is a great recipe for brunch parties! They would be great for brunch parties, and they reheat well in the oven too. They stay nice and crunchy! Well, your son had a fantastic idea! These look so good that I want them on my breakfast table ASAP. Nice and crunchy and filled with all those breakfast goodies, they would definitely be a treat in my house. I’ll tell my son you think so. Actually, he already knows because I’ve been telling him ever since we’ve made them. I don’t want his head to get too big. LOL Just kidding. These are such a fun breakfast! Perfect for a group or even for little ones! Oh, I’m sure the kids would gobble these up in seconds. Glad you like the recipe, Liz. Thank you.